Open source, or open your wallet? The huge popularity of the British-designed Raspberry Pi has caught Chipzilla's attention, and so you can now buy a similar bare-bones x86 PC named Minnowboard with a similar caseless design running an Angstrom Linux build. The system runs a 1GHz Atom E640 processor with integrated graphics, 1GB of DDR2 RAM, and 4MB of Flash firmware. It supports USB, microSD, and 10/100/1000 Ethernet, all on a little four-by-four inch circuit board. 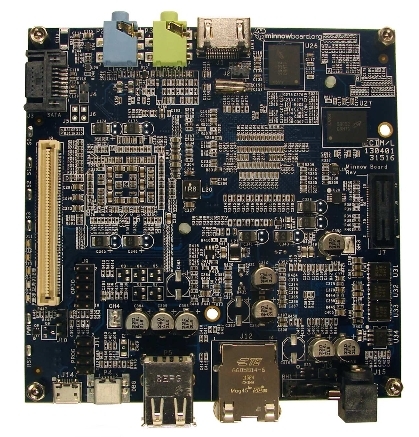 Expansion boards can be added to the device to give it additional functions, such as wireless connectivity, and Intel is hoping hobbyists and developers will design more for the system. Intel has made the Minnowboard compatible with the Yocto Project for Linux embedded development and sees this as a likely market. "Where the Minnowboard really shines is in its I/O performance," said Scott Garman, embedded Linux engineer at Intel’s Open Source Technology Center. "Powered by PCI Express, you can make full use of SATA disk support and gigabit Ethernet for high throughput applications such as file servers or network appliances." Schematics and design files have been posted on the Minnowboard community website under a Creative Commons license. Where Minnowboard really differs from the Pi is in price. Intel and partner CircuitCo Electronics are selling Minnowboards for $199 a pop, which is considerably more than the Pi's $35 price tag.